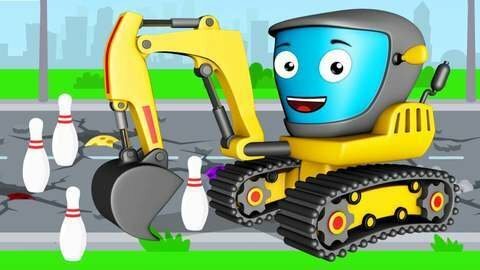 Enjoy this episode of car cartoon for kids where the happy Excavator accidentally lets go of his yummy cupcake. The cupcake causes the dump truck to slip and all the bowling balls and pins fall to the ground. Watch how the Excavator helps the Dump Truck to pick up all the litter in the end. Make sure you see all other complete episodes of car cartoons by visiting SeeZisKids.com.